The KONG story lives up to the saying “Necessity is the mother of Invention”. The founder Joe Markham was frustrated to see Fritz, his adorable retired police dog chewing endlessly on sticks, rocks and other such things. One day to distract him away from those harmful items, Joe threw out rubber car parts to Fritz who immediately felt stimulated to play with it. This set the ball rolling for Joe. 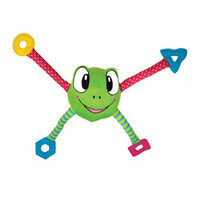 Inspired by the bounce and durability of the rubber, Joe set about to develop sturdy rubber toys for the next few years. Now the brand KONG makes products not only for dogs but also cats of all ages and breeds. The rubber supplies are available in small, medium and large sizes. Pet lovers can discover and explore the entire range of KONG dog toys, cat toys and puppy toys and order the best items for their pets, such as the KONG Wobbler. The assortment of KONG is made from their own proprietary and pet safe rubber that furry friends simply love to chew or play with. 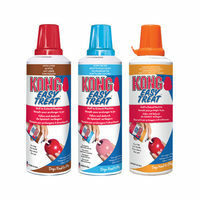 The regular bounce of KONG supplies keeps your pet engaged for hours of play and entertainment. The built-to-chew rubber is durable and fulfils your pet’s cravings for a satisfying chew. The range includes classics such as the Biscuit Ball with a hollow centre to hold Easy Treat paste and Stuff N Snacks. The bone-shaped ports of the ball filled with tasty treats keep your pet occupied for hours. Veterinarians, and trainers largely recommend the Kong Classic in red natural rubber for animals that love to chew and enjoy the games of fetch. 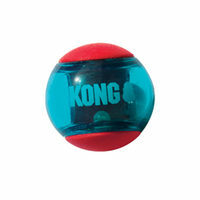 Pets love KONG as they are great for chewers as well as players. Owners also love them for their originality, quality, safety and the ample fun they provide. Products that can be stuffed with treats keep your loyal buddy engaged with activity and also prevent unwanted behaviours. Less boredom and stress: dogs may experience boredom and/or stress. KONG toys ensure that your four-legged friend remains active. Do you want to make the game even more interesting for your pet? 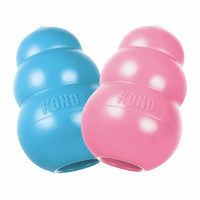 There are various fillable KONG toys where treats can be hidden. Training: KONG toys are a perfect tool to train your dog! For example, let your dog get used to his new crate by putting his favourite KONG toy inside. Better relationship: KONG toys can also be a way to strengthen the relationship between you and your pet. After all, playing together is the best thing there is! No more chewing: KONG toys are perfect for chewing games. From now on, your dog will leave your furniture, shoes and homework alone! Shop for puppy toys including teething sticks, activity balls and fun throw and fetch discs such as a Frisbee. The AIRDOG offers the Dual materials products that combine the tennis ball and the squeaker to create the classic fetch toy for dogs. Made from high-quality and durable SqueakAir supplies that use non-abrasive felt, they are safe for your dog’s teeth. Discover the range of products that include Air Squeakair Boomerang, Air Squeakair Buoy, Ultra Balls, Air Squeakair Disc and more. Shop for Airdog products such as the Squeakair Ball, football, Donut, Bone and Dumbbell. 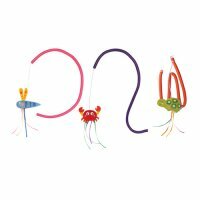 One such unique item in this range is the Off/On Squeaker-Bone which provides the option to switch off the squeaker for quiet play and alternately switch it on for loud squeaky fun sessions. 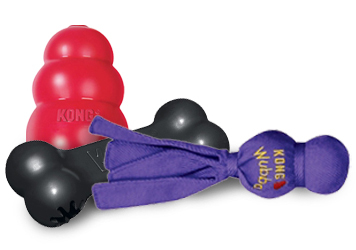 These fun KONG dog toys offer lot of squeaker action for enhanced play sessions. They come in many shapes and sizes that offer a variety of ways to play. KONG Puppy rubber supplies offer a range of soothing chews to train your puppies through the painful teething phase. Treat your puppy with a Puppy Goodie Bone or the Puppy Teething Stick whose grooves are stuffed with Easy treat. These fun items also work as treat holders and highly recommended for puppies. Amuse your puppy and keep the whole family engaged in an interactive game of fetch with the Puppy flyer. While the Wubba is great for tugging and fetching, use the Aqua for playing fetch in water. Kong’s Senior range of products made from softer rubber are designed to stimulate and encourage older animals to play and exercise while taking care of their ageing teeth and gums. The Snugga Wubba, covered with soft fabric is a great comforter and good for gentle and interactive indoor play. Shop for the Extreme range of products if your animal is an avid chewer. These black rubber items are sturdier than the red ones and are ideal for extreme chewers. These cat supplies come with easy- open pouches for refills of premium catnip with aromatic herbs that stimulate the senses. Gently twist them to release the flavor or sprinkle on your little tiger's favourite collection to attract and encourage your kitty to play. 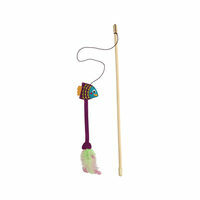 Spray on scratchers, teasers, or cat condos for irresistible fun. Catnip mice 2-pack made of soft fabric for cuddling also encourage active play for all ages. 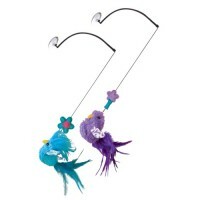 The Kitty Mobile consists of multiple dangling mobile products with height adjustment to keep your cat enticed.